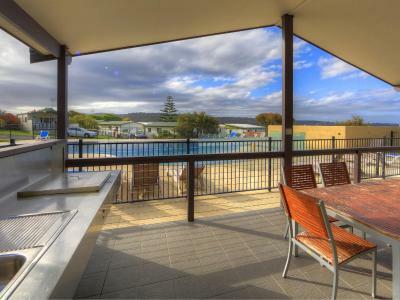 Lock in a great price for NRMA Merimbula Beach Holiday Resort – rated 9 by recent guests! The spa bath was a god send after a night in the bouncy back breaking bed. Two water areas that the kids loved. Plenty for.them to do. Other customers there very kid friendly. Will be back with kids. Rooms were lovely and clean. 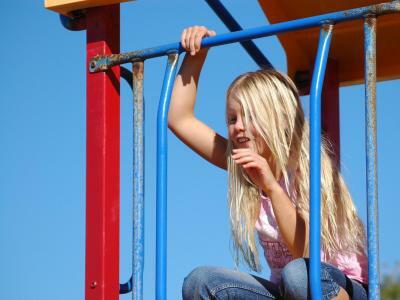 Plenty activities for the children and not far from the beach. Swimming pool was lovely. Lovely family experience for us. Had a relaxing spa in my room. The bed was so comfortable, we loved our holiday and will be back. Comfortable bed. Secret TV in cupboard in bedroom. BBQ on the deck - excellent. Patti at Reception was sensational. She made us feel very welcome and accommodated all our needs. She went above and beyond and deserves to be recognised. The water park and pools were great for kids entertainment. Impeccably maintained, great facilities, friendly staff. Happy to recommend. Location is perfect, we didn’t have to leave the park to keep the 6 year old busy. One of our best sellers in Merimbula! 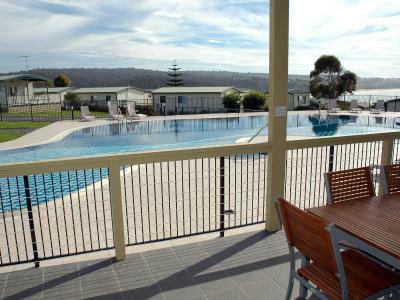 Located on the Sapphire Coast, NRMA Merimbula Beach Holiday Park offers a swimming pool and free onsite parking. All accommodations offers cooking facilities. Some accommodations features a spa bath and ocean views. 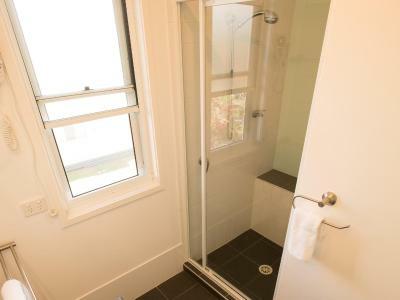 The property is 5 minutes' walk from Short Point Beach. 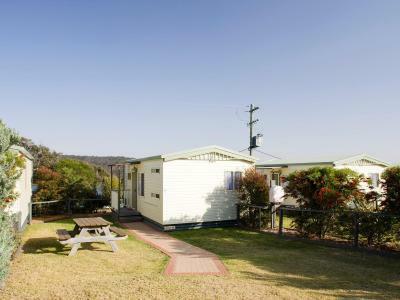 Merimbula Beach Holiday Park is 8 minutes' drive from Merimbula Beach. 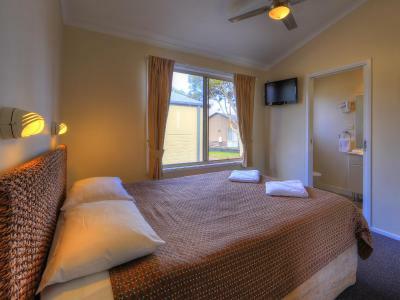 It is 21 minutes' drive from Merimbula Aquarium & Wharf Restaurant. Guests enjoy access to a tennis court and sand volleyball court, while the younger ones enjoy the jumping pillow and kids' club activities. 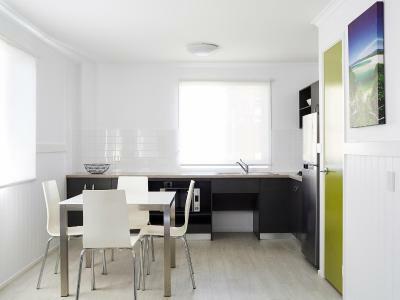 All accommodations offers a fully equipped kitchen, a dining setting and a private bathroom. Extras include bed linen. 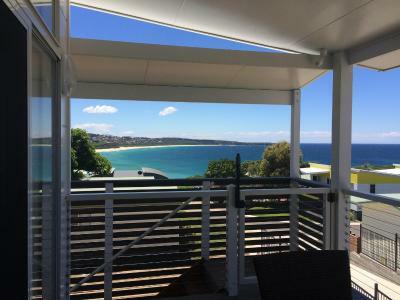 This property is also rated for the best value in Merimbula! Guests are getting more for their money when compared to other properties in this city. 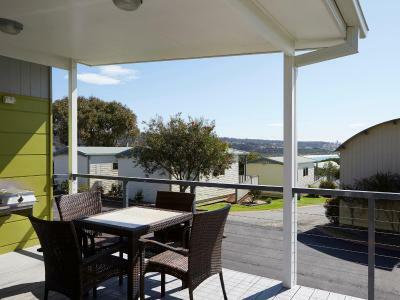 When would you like to stay at NRMA Merimbula Beach Holiday Resort? This Condo features ocean views from its clifftop location as well as air-conditioning and ceiling fans, a kitchen with fridge, dishwasher, microwave, oven and stove top and 2 private bathrooms. 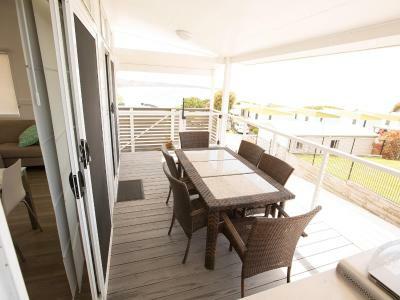 Also included is a veranda with barbecue and outdoor dining. A dining and lounge area is also featured and there are 3 TVs, DVD player, and cable channels. The cabin has ramp access and a car space next to it. Featuring views across the ocean, this villa includes air-conditioning and ceiling fans, a kitchen with fridge, dishwasher, microwave, oven and stove top and a bathroom with a spa bath. The veranda has outdoor dining and a portable electric grill. Also featured is a dining and lounge area with a TV, DVD player, and cable channels. 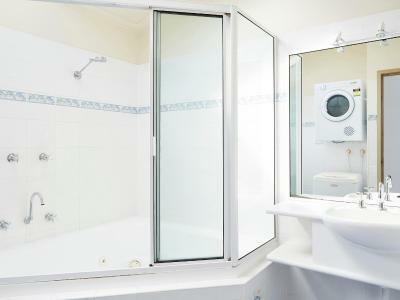 A washing machine and dryer are also included in the villa. There is a car space next to the villa. This North facing villa is positioned close to the pool and tennis court at the property, with glimpses across the Sapphire Coast. 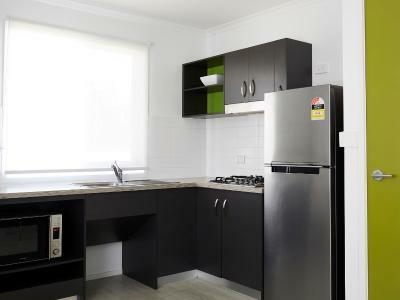 It features air-conditioning and ceiling fans, a kitchen with fridge, convection microwave, and stove top and a bathroom with toilet with assistance rails. The veranda has outdoor dining and a portable electric grill. Also featured is a dining and lounge area with a TV, DVD player, and cable channels. 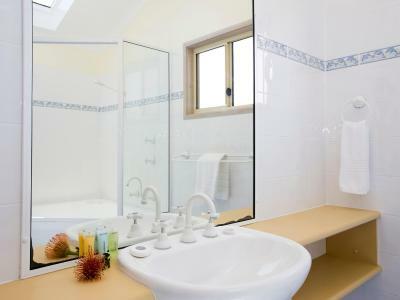 A washing machine and dryer are also included in the villa. There is a car space next to the villa. 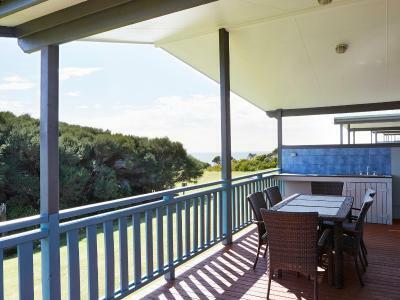 This North facing villa features views up Short Point Beach and the Sapphire Coast. It includes air-conditioning and ceiling fans, a kitchen with fridge, microwave, oven and stovetop and a bathroom with spa bath. The veranda has outdoor dining and barbecue. Also featured is a dining and lounge area, 2 TV's, a CD player, DVD player, and cable channels. A washing machine and dryer are also included in the villa. There is a car space next to the villa. Positioned on Short Point with views across the park to Short Point Beach, this Bungalow features air-conditioning, a kitchen with fridge, microwave, and stovetop and a bathroom. The veranda has outdoor dining and portable electric grill. Also featured is a dining and lounge area with TV, DVD player and cable channels. There is a car space next to the bungalow. 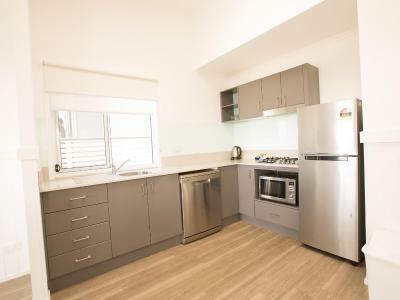 Located a short walk across the parkland to Short Point Beach, this Bungalow features air-conditioning, a kitchen with fridge, microwave, oven and stovetop and a bathroom. The veranda has outdoor dining and portable electric grill. Also featured is a dining and lounge area with TV, DVD player and cable channels. There is a car space next to the bungalow. Located close to the barbecue area and children's playground, with glimpses of the Sapphire Coast, this Villa features a kitchen with fridge, air conditioning, microwave and stovetop and a bathroom with a spa bath. The veranda has outdoor dining and portable electric grill. Also featured is a dining and lounge area with TV and DVD player. There is a car space next to the villa. Located close to pool, children's playground and barbecue area, with glimpses of the Sapphire Coast, this villa features a kitchen with fridge,air conditioning, microwave, oven and stovetop and a bathroom. The veranda has outdoor dining and portable electric grill. 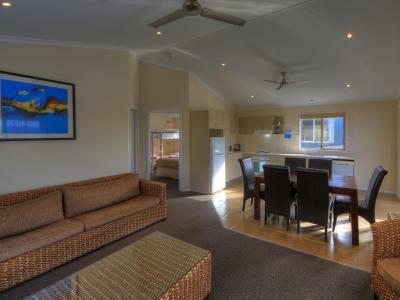 Also featured is a dining and lounge area with TV and DVD player. There is a car space next to the villa. 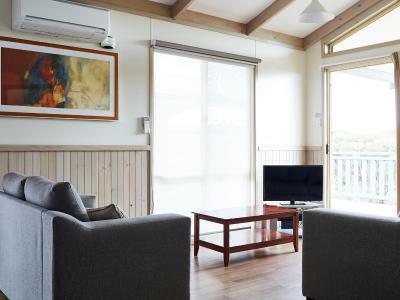 Located close to children's playground and barbecue area, with glimpses of the Sapphire Coast, this villa features a kitchen with fridge, microwave, oven and stovetop and a bathroom. 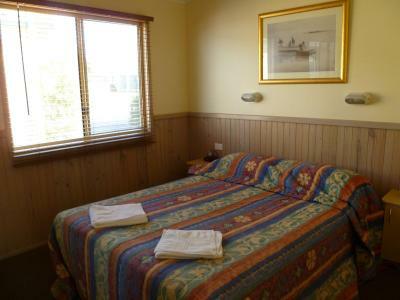 There is a dining and lounge area with TV and DVD player and a car space next to the villa. 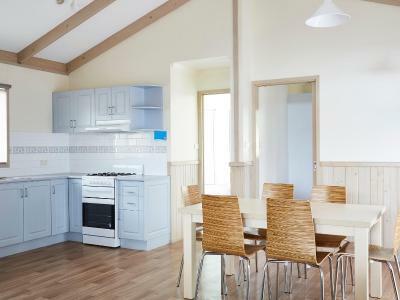 Centrally located in the park close to the pool, children's playground and barbecue area, this cottage features a full kitchen with fridge, microwave, oven and stovetop and a bathroom with a bath. The veranda has outdoor dining. Also featured is a dining and lounge area with TV and DVD player. There is a car space next to the cottage. 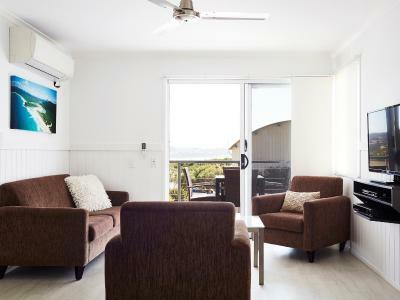 Centrally located near the pool with a short walk to Short Point Beach, this bungalow features a kitchen with fridge, dishwasher, microwave, oven and stovetop and a bathroom with a spa bath. 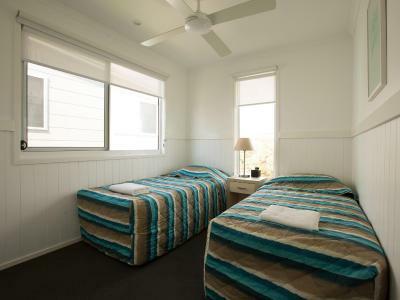 Also included are ceiling fans and a dining and lounge area with TV and DVD player. There is a car space next to the bungalow. This bungalow is located in a garden setting and is centrally located in the park close to the pool, jumping pillow and games room. It features air-conditioning, a kitchen with fridge, microwave, oven and stovetop and a bathroom with a bath. Also included is a dining and lounge area with TV, CD player and DVD player. There is a car space next to the bungalow. Perched on the clifftop with views of the Pacific Ocean and close to the pool, this Villa features air-conditioning and ceiling fans, a full kitchen with fridge, dishwasher, convection microwave, oven and stovetop, 2 bathrooms and a separate toilet. 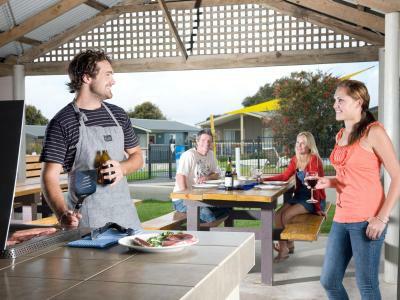 The veranda includes a barbecue and outdoor dining. There is also a dining and lounge area with a fireplace, 4 TVs, CD player, DVD player, and cable channels. A washing machine and dryer are also included and there is covered parking. The Villa has ramp access. 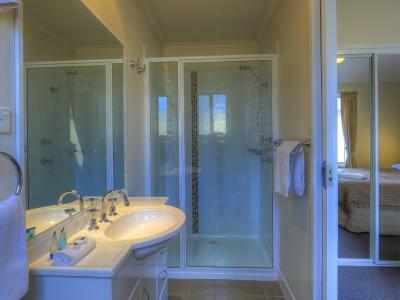 Located on the clifftop overlooking the Pacific Ocean and close to the pool. 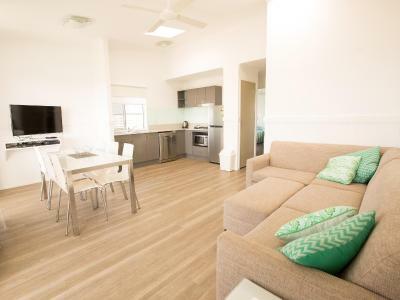 this bungalow features air-conditioning and ceiling fans, a full kitchen with fridge, dishwasher, microwave, oven and stovetop and a bathroom with spa bath and separate toilet. The veranda includes a barbecue and outdoor dining. There is also a dining and lounge area, 2 TVs, CD player, DVD player and cable channels. 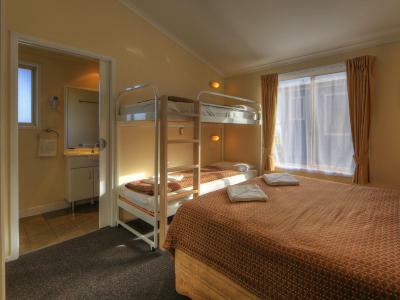 A washing machine and dryer are also included and there is covered parking. The Villa has ramp access. Located on the clifftop with views across the ocean to Short Point Beach, this villa features air-conditioning and ceiling fans, a kitchen with fridge, dishwasher, convection microwave, and stovetop and a bathroom and separate toilet. The veranda includes a barbecue and outdoor dining. There is also a dining and lounge area, 2 TVs, CD player, DVD player and cable channels. A washing machine and dryer are also included and there is covered parking. The Villa has ramp access. Positioned next to the pool, this villa features air-conditioning and ceiling fans, a kitchen with fridge, dishwasher, microwave, oven and stovetop and 2 private bathroom. The veranda includes a barbecue and outdoor dining. There is also a dining and lounge area, 3 TVs, DVD player and cable channels. The Villa has ramp access. North- facing and overlooking the Short Point parkland, this villa features a balcony, air-conditioning and ceiling fans, kitchen with fridge, dishwasher, microwave, oven and stovetop and a bathroom with spa bath. The veranda has outdoor dining. 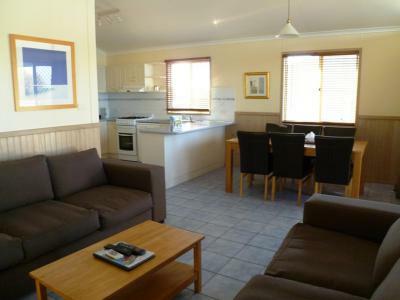 Also included is a dining and lounge area with TV, DVD player and cable channels and a washing machine and dryer. The villa has a car space next to it. 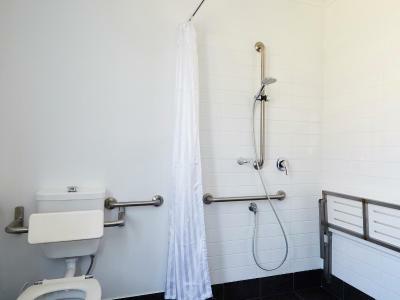 This self-contained cabin includes ramp access and accessible fixtures and fittings. Positioned close to the pool with views to the bay, it features air-conditioning, a kitchen with fridge, dishwasher, convection microwave, and stovetop and a bathroom with hand rails and a roll-in shower with chair. The veranda includes outdoor dining. 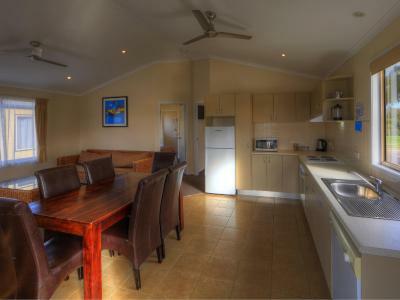 Also featured is a dining and lounge area with TV, DVD player and cable channels and a washing machine and dryer. The villa has a car space next to it. This bungalow features a garden setting centrally located in the resort close to the pool. 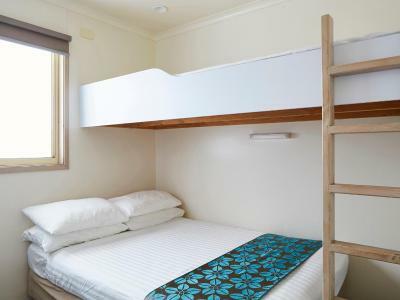 The unit is fitted with a jumping pillow and games room. 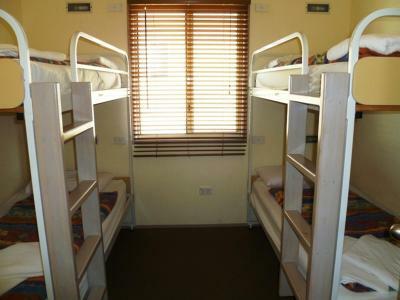 It also comes with a queen bed and one double with top single bunk. 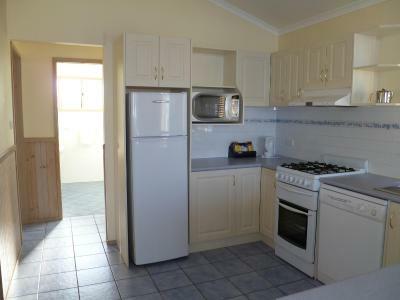 It features air-conditioning and has a kitchen with a fridge, microwave, oven and stove top. 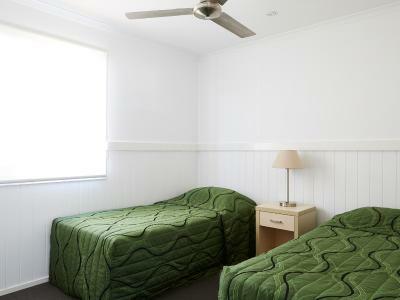 The bungalow has a dining area and lounge with TV and DVD, and a bathroom with hip bath. The bungalow comes with one car space. 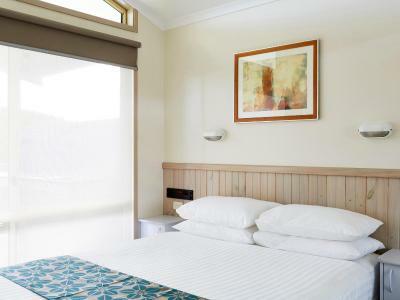 Located at Merimbula on the beautiful NSW South Coast, NRMA Merimbula Beach Resort & Holiday Park is the ultimate beach holiday destination offering a great range of accommodation, sites and facilities. 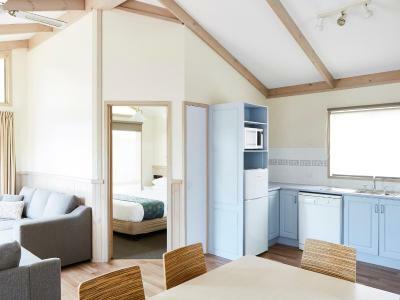 Our 4.5 star park has a large range of modern self-contained accommodation options available from 1, 2 and 3 bedroom cabins and villas to our Beach House, which has 3 bedrooms, sleeps up to 8 people and is superbly located just a short walk from the beach. 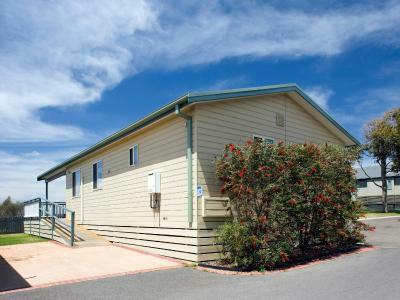 We also offer a great range of ensuite, powered and unpowered caravan, RV and camping sites, most of which are located overlooking the ocean. 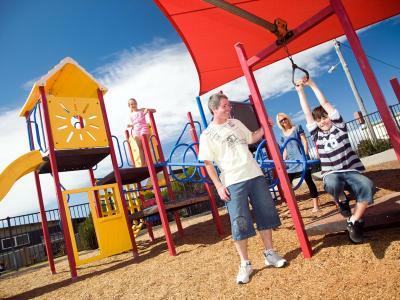 The large range of fun activities and facilities at our park will keep everyone in the family happily entertained. 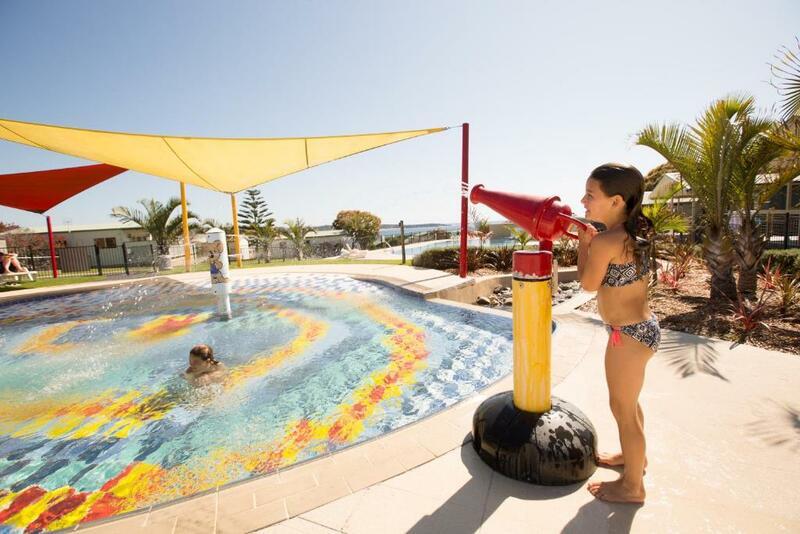 The kids can jump on the jumping pillow, play in the playground or have a game of sand volleyball while you enjoy the heated resort pool, play tennis or relax with coffee and cake at our Cheeky Mango Café. 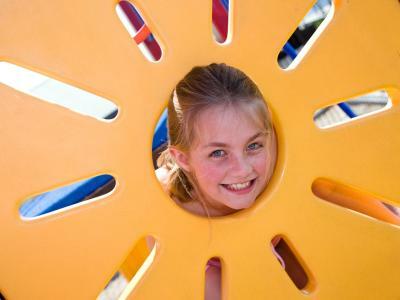 We also offer a fantastic Kidz Korner activities program all year round! With a conference room, modern facilities and a fantastic range of accommodation and sites, the park is ideal for groups, reunions, weddings and conferences. House Rules NRMA Merimbula Beach Holiday Resort takes special requests – add in the next step! NRMA Merimbula Beach Holiday Resort accepts these cards and reserves the right to temporarily hold an amount prior to arrival. 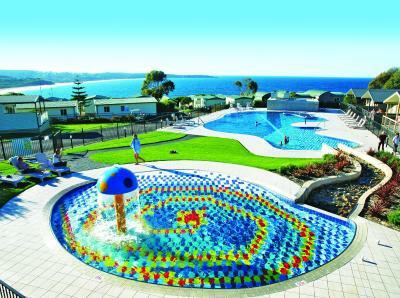 Please inform NRMA Merimbula Beach Holiday Resort of your expected arrival time in advance. You can use the Special Requests box when booking, or contact the property directly using the contact details in your confirmation. 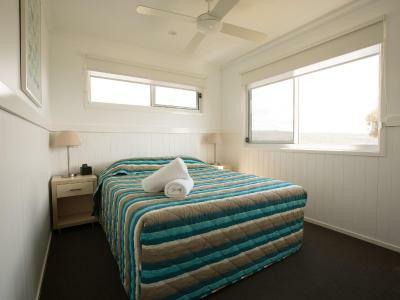 It’s a small thing but had spa cabin up front,overlooking beach,master bedroom had high ceilings with windows up high,bottom windows had double blinds.probably wouldn’t bother some people,I just like a dark bedroom,was ok though and windows weird shape that would be difficult to put a blind on. We liked the proximity to the pool, tennis court and beach. All staff we obliging and polite. The accomodation was very comfortable . Great place for the kids, they loved it.